Greetings, I am Judi Magaldi with the Indiana State Department of Health (ISDH). I began my journey with the ISDH Asthma Program (Program) in 2013 as the communication coordinator and evaluator. My role has changed over the years. I now occupy the position of Asthma Program Director and share evaluation duties with the Program Epidemiologist. I would like to share information on how I have been able to incorporate post-evaluation action planning into program planning. In 2012, the Asthma Program contracted with an independent evaluation consulting firm to develop and implement a mixed methods evaluation of Program surveillance data dissemination methods. The evaluation provided insight into the use of and satisfaction with the data by stakeholders from around the state. After reviewing evaluation results, we determined that it would be beneficial to identify actions to improve the use, satisfaction, and reach of Program data. 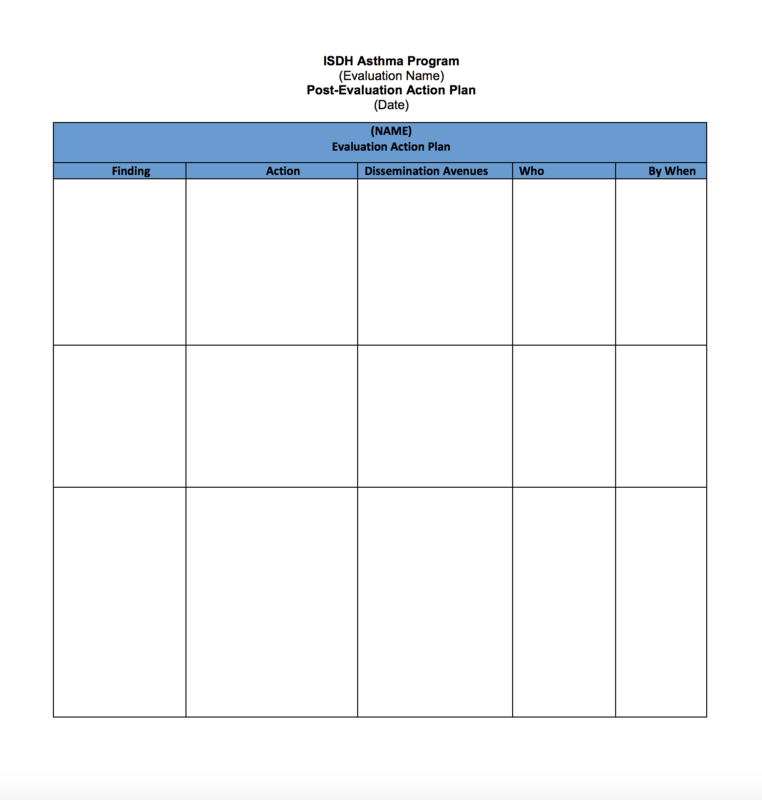 To document the action identified and provide benchmarks for completion, we created a post-evaluation action plan (Plan). The Plan worked to serve as a roadmap for future Program efforts, documenting the finding, action, dissemination avenues, and who and by when actions would be taken to ensure the evaluation result. We chose a template that is fairly simple and easily understood so that future users who may not know the history of the Program and the background of activities will find it useful. Many other templates exist online and can be tailored to the needs of the stakeholder and the complexity of the program being evaluated. Over time, the Program has experienced changes in staff and Program data requirements and communication methods. The post-evaluation action plan helps new staff understand the progression of decisions and programmatic adjustments based on evaluation findings, and it continues to be a tool for communication product improvement. Lesson Learned: It is not enough to ask evaluation questions. There needs to be follow-up to the results to ensure utility of the evaluation. Post-evaluation action plans help to answer the “what then” of the guiding questions, reducing wasted resources to create a document that sits on a shelf and keeps the time-consuming, and sometimes costly evaluations, from becoming meaningless documents. Hot Tip: To encourage evaluation capacity building, external partners can be brought to the table to assist in creating action plans for their organizational project evaluations. Inclusion assists in determining the logical next steps for continued partnership efforts, ensuring that actions are feasible and consistent with needs and setting goals for how to proceed. This approach also assists in identifying new partnerships that may be beneficial to future endeavors. Rad Resource: The Community Tool Box’s Action Plan Form is a straightforward template for community groups.